Visitors are very welcome to Lime Park which is ideally situated within reach of Belfast City and International Airports and Larne and Belfast ferry terminals. Excellent fishing, golf, sports facilities and cinemas are all within easy reach. Night life is good and can be enjoyed in the many local pubs and restaurants while city night life can be enjoyed in Belfast - a mere 20 minutes away. 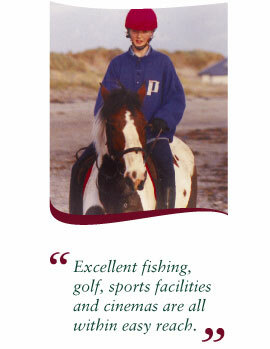 Contact us to enquire about our new range of Equestrian Holidays.